Iron is a grayish/silver metal that has been around for thousands of years. It is widely available, strong and fairly easy to work with when cast in a liquid form or wrought (worked) with tools. Iron's biggest disadvantage is that it can quickly rust. To prevent this, iron or steel can be galvanized with a zinc coating or painted. Iron is the fourth most abundant element and makes up more than 5 percent of the earth's crust. It exists naturally in iron ore (sometimes called ironstone). Since iron has a strong affinity for oxygen, iron ore is an oxide of iron; it also contains varying quantities of other elements such as silicon, sulfur, manganese, and phosphorus. Smelting is the process by which iron is extracted from iron ore. When iron ore is heated in a charcoal fire, the iron ore begins to release oxygen, which combines with carbon monoxide to form carbon dioxide. What forms is a spongy, porous mass of relatively pure iron, intermixed with bits of charcoal and extraneous matter liberated from the ore, known as slag. The formation of this iron bloom was as far as early blacksmiths got: they would remove this pasty mass from the furnace and hammer it on an anvil to extract the cinders and slag and to compact the metallic particles. This process was known as wrought iron. The wrought iron contained about .02 to .08 percent carbon (absorbed from the charcoal) — enough to make the metal both strong and malleable. Wrought iron was the most commonly produced metal through most of the Iron Age. At very high temperatures, a radical change takes place: iron rapidly absorbs carbon and starts to melt, since the higher carbon content lowers the melting point of the iron. What results is cast iron, which contains from 3 to 4.5 percent carbon. This high proportion of carbon makes cast iron hard and brittle; likely to crack or shatter if dropped or hit forcefully, and it cannot be forged (that is, heated and shaped by hammering) at any temperature. By the late Middle Ages, European iron makers were working with blast furnaces, tall chimney-like structures in which combustion was intensified by a blast of air pumped through alternating layers of charcoal, flux and iron ore. Molten cast iron would run directly from the base of the blast furnace into a sand trough that fed a number of smaller lateral troughs. This configuration looked like a sow nursing her piglets, and cast iron produced in this way came to be known as pig iron. Iron could be cast directly into molds at the blast furnace base or remelted from pig iron to make cast iron stoves, pots, pans, firebacks, cannon, cannon balls or bells ("to cast" means to pour into a mold). Casting is also called founding and is done — you guessed it — in a in a foundary. Puddling is a method of converting pig iron into wrought iron by exposing it to heat and frequently stirring in a furnace in the presence of oxidizing substances. Invented by Henry Cort in 1784 (superseding the finery process), it was the first method that allowed wrought iron to be produced on a large scale. What's the Difference Between Iron and Steel? Actually, steel is iron that has been made hard with chemically dissolved carbon. The development and manufacture of steel during the 19th century made all of those skyscrapers and suspension bridges possible. How Can I Tell If It's Wrought Iron and Not Cast Iron? Good question. For starters, cast iron is heavier. 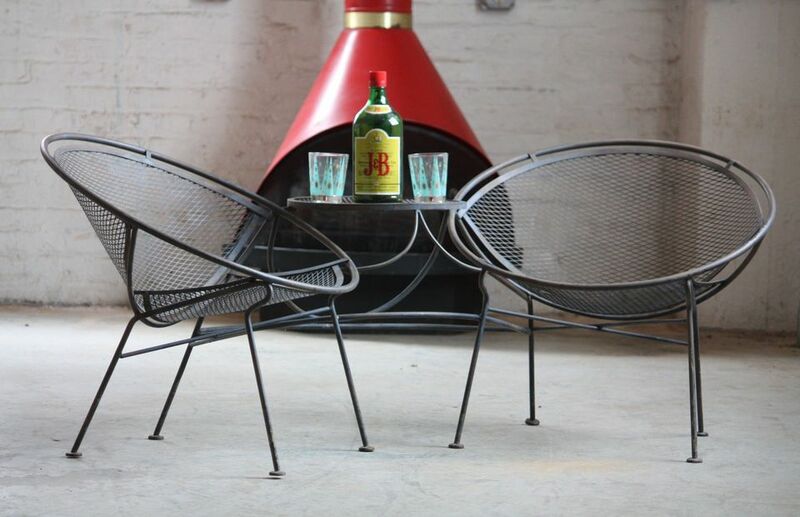 Wrought iron is more lightweight and takes on more curves and twists. It's able to do more because of its malleability. Wrought iron is softer to forge or bend or weld. Cast iron is more fragile and breakable, while wrought iron bends rather than breaks. Wrought iron is easier to weld than cast iron. Examples of early 19th-century garden furniture made of wrought iron can be seen in Antiques From the Garden by Alistair Morris (Garden Art Press; 1996). Most were benches with slatted seats, some with paw feet and curving, often intricate, scrolled or reeded backs in styles such as Regency (not Hollywood Regency, which followed more than a century later), Sheraton and French. Manufacturers of early 1800s wrought iron garden furniture included Brown & Freet, Stourbridge; Barnard Bishop & Barnards and Norwich Iron Works. Like housing and just about everything else, the demand for patio furniture boomed after World War II, when returning soldiers married, started families and bought homes in the suburbs. It was all part of the new American Dream. Manufacturers of wrought iron garden furniture from the mid-20th century include Woodard, Salterini, Homecrest, Brown Jordan and Tropitone. So, What is Rod Iron? You may have come across references to "rod iron" and even "rot iron" patio furniture while perusing sites like eBay and Craigslist for vintage garden furniture. There is no such thing as rod iron furniture nor rot iron. True, you can bend an iron rod and twist and weld it into furniture, but that's not what we're talking about here. And rot — well, would you want anything rotting on your patio or in your yard?